One of the most thrilling, and often daunting, things about moving to the other side of the world has been discovering new produce. At the moment, every trip to the local grocer or greenmarket is still very much research and development for me, as I take in the new colours, influences and flavours of my new surroundings. Every Sunday, a small local greenmarket is set up outside my kids’ school in Carroll Gardens PS58. It has a cheese stall, a turkey farmer, apples galore, textiles recycling and communal compost bins. It was here where I stumbled upon black soy beans and the deep green leaves of tatsoi. Needless to say, I had to have. The next day, I took my bounty of beans and leaves to Sunday Suppers, and we cooked this simple salad together. 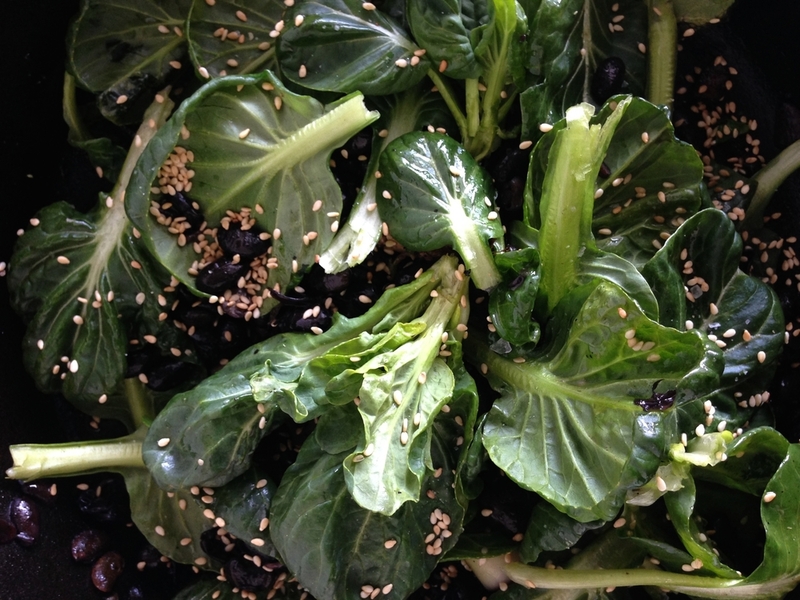 The black soy beans are wonderfully nutty and combine harmoniously with the green earthiness of the barely-wilted tatsoi. Black soy beans are very similar to green soy beans, or edamame, as we more commonly call them. These one were raw and fresh, so need to be cooked a little longer. They retain a fantastic bite when cooked. They can be hard to find, so substitute with regular edamame (frozen ones are fine!). In Australia, tatsoi is more regularly sold as part of salad leaf mixes (which is a shame). You could substitute with baby spinach leaves or baby bokchoy. This recipe is courtesy of Karen Mordechai at Sunday Suppers. All food photos below by Karen Mordechai. Karen has just released a beautiful cookbook called Sunday Suppers, full of fantastic recipes for family and friend gatherings. You can get the book here. Add the olive oil, garlic, salt, sugar and cilantro to a cast iron pan and heat until fragrant, about two minutes. Add the drained beans and cook for a further two minutes, ensuring to coat the beans in the fragrant oil. Add the water little by little, so as not to immerse the beans completely but merely to saute them slowly. Do this intermittently for 40 minutes, at which point the beans should be slightly softer but still have some firmness. Turn off the heat and add the tatsoi to the pan with some more olive oil, salt and sesame seeds. Serve immediately as this is best eaten when warm.